We recommend today the visit of a different museum. A space to discover the importance of concrete, yes concrete, in our civilization. 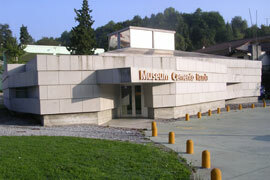 The Cemento Rezola Concrete Museum lies just in front of the Concrete Industry of the same name. Inside a concrete buiding with a central window on the ceiling it displays information about the present and past of this industrial world (raw materials, its way of production, etc.) and the evolution on the way of life, materials, architecture, engineering, art and environment that concrete has allowed. It gives also tribute to the concrete factory nearby which with a history of 150 years is one of the oldest in the country.